Whether it be simply the preference of the homeowner, or an attempt at increasing home value, hardwood flooring is increasing in popularity. Hardwood floors can add a touch of class to a smaller home, and make larger homes really show off their square footage in a way that carpeting cannot compete with. If you are considering outfitting your home with hardwoods, style and durability will be your two biggest categories to explore, after cost. Some hardwood options, while stylish, lack the durability of others, and care would need to be taken in order to not wear out your new home addition prematurely. 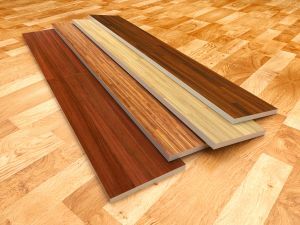 Below, I'll list some of the more popular varieties of hardwood flooring options. Wide-Plank - Wide-plank flooring is quickly becoming one of the more popular options for people looking to add a touch of class to a room or home, without sacrificing their floor's durability. This style of flooring gives you a wide variety of wood options and styles to choose from, but woods with complex grains are the preferred way to go. Wider planks allow the natural beauty of woods like Hickory and Tigerwood a chance to shine. Reclaimed Pine - This eco-friendly option is also a popular favorite. Perfect for homes that already possess a rustic flare, reclaimed pine flooring can add a touch of historical class to any home. And because one of the primary sources of reclaimed pine flooring are historical buildings, this is an environmentally-friendly alternative to some of the more extravagant hardwood varieties, like Brazilian hardwoods, or teak. Reclaimed pine is just one of many varieties of reclaimed wood, so shop around a little. Almost all reclaimed hardwood options will add a touch of mature class to a home. Eucalyptus and Ebonized Hardwood - These varieties are extremely dark and elegant. Best paired with contemporary homes. If you are partial to white furniture and decor, this variety will serve to complement your design style immensely. Red Oak - This variety of flooring is gaining a reputation for it's ability to successfully coordinate with any design style, as well as it's durability. Red Oak is a fantastic choice for homes with children, as the durability of the wood will prevent most scuffs and dents that a high-traffic family would normally dish out on a less-resilient wood variety. The lighter, warmer colors of the wood also serve to heighten the brightness and color of a room, which may be preferred in houses that don't get a lot of natural light. Brazilian Cherry - This variety is the classic "mosaic hardwood". The natural variation in color from plank to plank is an eye-catching addition to any home, while the affordability factor is also an appeal.